All Rise, the Honorable Judge of Main-stream Media is here in the court of public opinion. 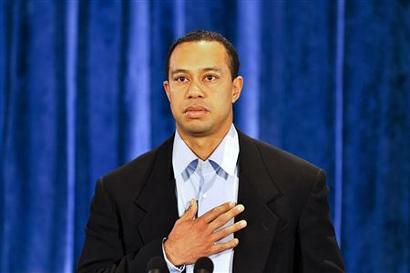 Well, were you one of the 100 million people who tuned in to the press conference of Tiger Woods on Thursday, I was. Hi-jacked by the news stations and forced to watch it might be a better way to put it. I think they even interrupted Curious George or Dinosaur Train on PBS to broadcast the press conference. My son was mad. Here a few thoughts on the whole situation before I drop it never to be brought up again, because, well I really don’t care. I’m not a golfer, I don’t enjoying watching it, and honestly, I don’t care. I thought the speech was a good one, he seemed to cover all the bases and I really thought he said the right things to the right people. I appreciate how he wants to keep certain matters private. I think that is something that many young people can learn from today. Resist the temptation to post on Facebook everything you are doing no matter how personal or private it is. I think my favorite is “Going to take a shower.” Thanks for telling usand don’t forget to wash behind your ears!! Secondly he, owned up to his mistakes. He admitted what he did was wrong and he took all blame and responsibility for his actions. This was a breathe of fresh air in the John Edwards, Bill Clinton, Steriod using Baseball players era where people continue to deny the truth in order to save face. It’s amazing how forgiving the world is when you say, I’ve made a mistake and I’m sorry. Last, enough with all the post-conference commentary and picking-apart of his speech. Can’t we just let his words speak for himself and not ponder if he meant what he said or not. The only persons that would know that would be God and Tiger Woods. Just let his words speak for themselves and take them at face value. This entry was posted on Monday, February 22nd, 2010 at 1:22 pm and is filed under In The News. You can follow any responses to this entry through the RSS 2.0 feed. You can leave a response, or trackback from your own site.